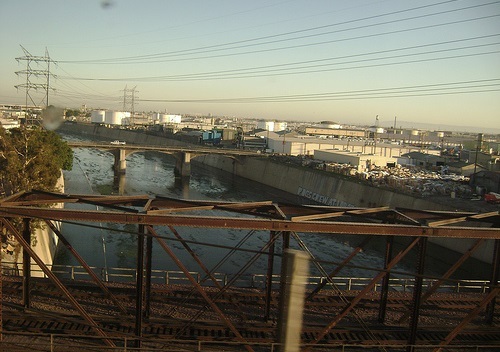 So says Catherine Gudis, a professor of public history at the University of California, Riverside, and one of the founders of Play the LA River, described as a “game of urban exploration and imagination.” The game consists of a 51-card deck developed by members of Project 51, a collective of “LA River–loving artists, designers, planners, writers and educators,” that invites Angelenos to explore—and reclaim—a river that for decades was “a polluted, concrete-encased ditch,” as reported in Next City. The deck has four “suits”—Valley, Glendale Narrows, Downtown, and South. Each card includes a map showing parking, bike trails, restrooms, and neighborhood markers, and each site is rated on a “gritty to green” scale so visitors have an idea what they are in for. The cards are about eight by five inches in size and are available to the public for free. Project 51 produced 5,000 decks, and they hope to print more. Play the River is meant to be a catalyst, inviting the public to “build their own relationship” with the Los Angeles River. The project’s website hosts a community calendar where people can add their own tours and activities. And Project 51 co-hosts events with other nonprofits, sometimes with an emphasis on environmental issues, other times on social issues, including the potential for “a divide between privileged and neglected sections of the river.” Artist, writer and Play the River co-founder Jenny Price sees the river as a metaphor for larger problems in Los Angeles, including “its division of neighborhoods by impermeable infrastructure, inequity of air quality, lack of park space, poor water management, and economic disparity,” according to Next City. Price has been advocating for the river for nearly 15 years, and believes its redevelopment has the potential to help address some of these issues. In New York, the Interdisciplinary Laboratory for Art Nature and Dance (iLand) recently hosted a workshop titled Water + Im/migration, designed to “explore themes of water and im/migration through both traditional and contemporary opera, music, dance, and theater practices. We will incorporate personal histories and trainings to investigate our relationship to the river (with traditional water & boat scenes from Chinese Opera serving as primary source material).” iLand has completed a number of other environmental dance projects, many as cross-disciplinary artistic collaborations. In Philadelphia, Invisible River “creates live public performance events celebrating the beauty and magic of water on our local rivers, the Schuylkill and Delaware in Philadelphia and bodies of water throughout the region.” This small company’s annual signature event features dance performances on the banks of the Schuylkill, as well on the river, with some dancers in boats and others suspended from a bridge; audience members line the river banks to watch for free, or pay to experience the performances in canoes, kayaks, dragon boats and other vessels. Based in Utah, The Crossroads Project combines the Fry Street Quartet with narration by physicist and educator Dr. Robert Davies, plus visual images, “to explore the impact of society’s unsustainable systems, Earth’s rapidly changing climate, and humanity’s opportunity for a new direction.” The result is a unique approach to performance art, intended to be both viscerally and intellectually stimulating. UK-based theatre company Pursued by a Bear Productions and Philadelphia-based theater company Tiny Dynamite are collaborating on an international, “trans-media” eco-thriller set in 2039, called “The Lamellar Project.” The play will feature “live, skyped, online and filmed” components, with actors and real-life scientists interacting across the Atlantic. The project is intended as both experimental theatre and a means of engaging audience members in live and online dialogues about environmental issues. The Environmental Defense Fund wants to buy a pricy satellite to gather consistent and reliable data on methane gas levels. It’s the kind of notion that just might fly.